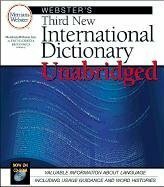 If big is better, the unabridged Webster's Third New International Dictionary is among the best. Weighing 12.5 pounds and measuring 4 inches thick, its 2,662 pages define more than 450,000 words spanning "a" to "zyzzogeton," including words ("disselboom" for instance) not found in other dictionaries, plus clear definitions, comprehensive etymologies, interesting asides, literary usage quotes, and a comfortable typeface. More than 150 years of accumulated scholarship helped collect the 10,000,000 usage examples that accurately provide definitions, and $3,500,000 went into producing this impressive volume. With Webster's Third you get a lot of dictionary for your money.